Local communities will be allowed to block controversial windfarm developments under plans set out by Conservative leader Ruth Davidson today. An independent inquiry would also be staged into the recent crisis over late subsidy payments to farmers. Ms Davidson also called for broadband to be rolled out across Scotland by the end of the decade as part of the party’s rural action plan unveiled today at an event with business leaders in the Cairngorms. Ms Davidson accused the SNP Government of a “central belt bias” which has been damaging for the rural economy. The plan unveiled by Ms Davidson would see more affordable rural homes in Scotland and measures to allow retiring farmers to build a home on agricultural land. Ms Davidson said: “Rural Scotland is already just about the most beautiful place on earth. But we need to make sure it has a better quality of life too. “Pledges like accelerating rural broadband coverage, empowering communities over issues like local policing and windfarm development, and supporting affordable housing for young people will ensure that happens. Fishermen will get new help to comply with new regulations and there will also be an increase in the number of National Parks across Scotland. 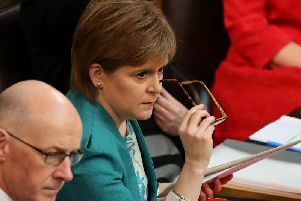 Farmers in Scotland have been left hundreds of millions of pounds out of pocket after a Scottish Government IT system failure.